Time ran away from me, or I did not pay attention – sorry, everyone! Either way, I am late in making this announcement. Some woodworkers have avoided making arched raised panel doors for two reasons: the difficulty of making arched cuts and the expense of hold-down jigs. This system solves both problems by eliminating the need for high-cost hold-down jigs. 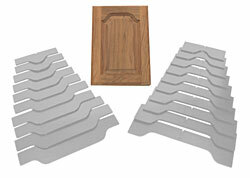 Each of our five twenty-piece template packages includes ten sizes for the panels and the ten corresponding templates for the matching arched rails. Each template is individually stamped with its size which indicates overall door width; any door between 9-1/2″ and 22″ can be made. All templates are made of rugged HDPE plastic for years of use.